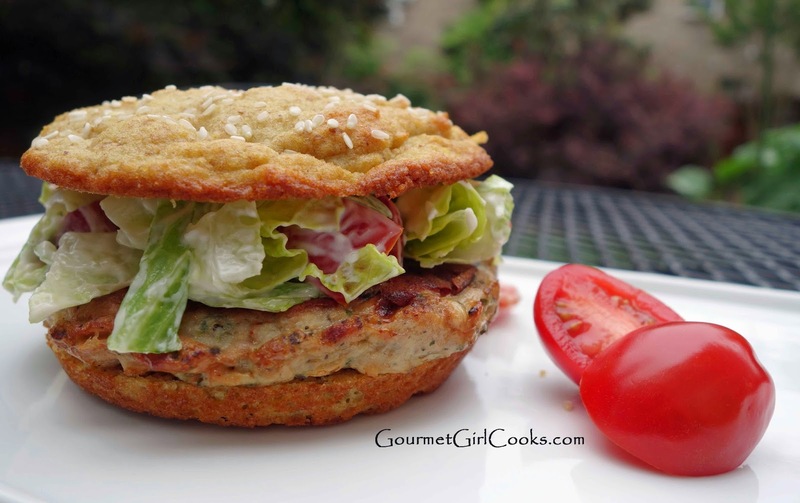 Gourmet Girl Cooks: Lunch w/ One of Today's Costco Finds! This morning we actually went to Costco AGAIN (we did our regular shopping there last night). We had a loaner car while my car was being serviced, so we ran a few errands and decided to swing by a nearby Costco that wasn't the one we typically shopped at. 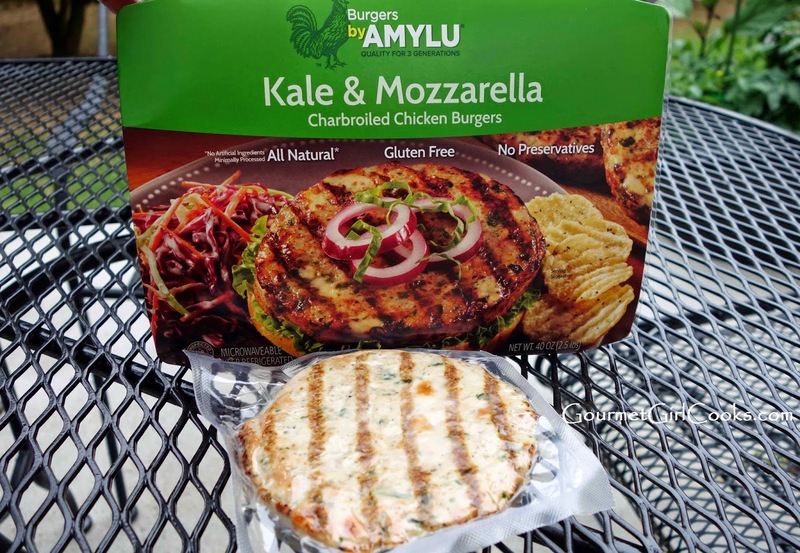 I picked up a package of Chicken Burgers with kale and mozzarella (made by Amylu). They looked good and the ingredients checked out, so I decided to give these a try. 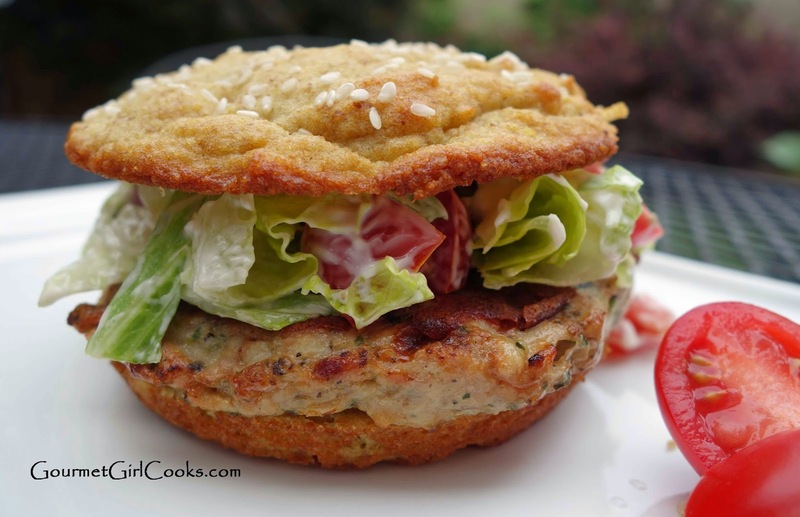 While I typically prefer to make my own "burger concoctions"...I occasionally like to try items like this and file it away in the back of my head as a potential convenience food that might be nice to take with us when we go on vacation. These come 10 to a large package. Two burgers are wrapped together (5 sets of 2 burgers). When we got back home, I made one for my lunch. They are already pre-cooked and can either be microwaved or pan seared to heat. I pan seared my burger which only took about 4 or 5 minutes, tops. 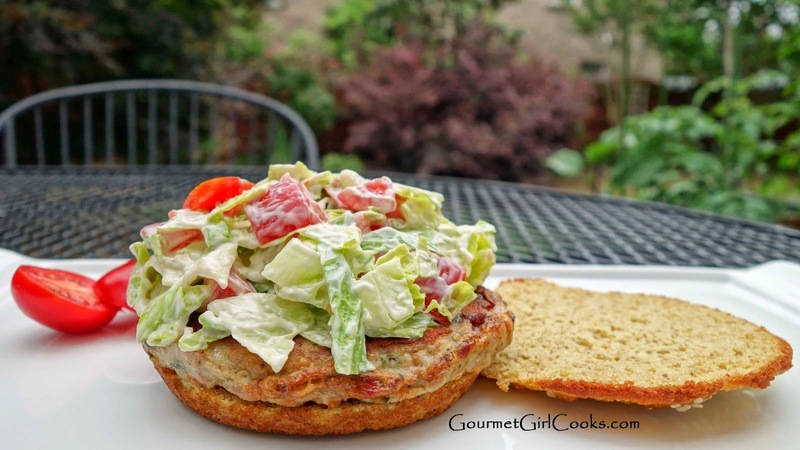 I sliced one of my Sesame Seed Buns, diced a couple of large cherry tomatoes, shredded a little romaine and made a "tomato-lettuce slaw" by tossing them with a couple teaspoons of mayo. I really enjoyed it. These can be frozen for up to 6 months or refrigerated until the use by date on the package. I would definitely consider taking some of these with us on vacation for a quick lunch after a morning at the beach, etc. I snapped a few photos below. Enjoy! They are extremely high in salt. Do you have a recipe how we could copy this at home? Just tried the cheese Amylu burgers from Costco. Had to say I was very disappointed. The consistency is that of Spam, very processed. I had been buying chicken burgers from the meat department of my grocery store but they are being taken over by Kroger soon. 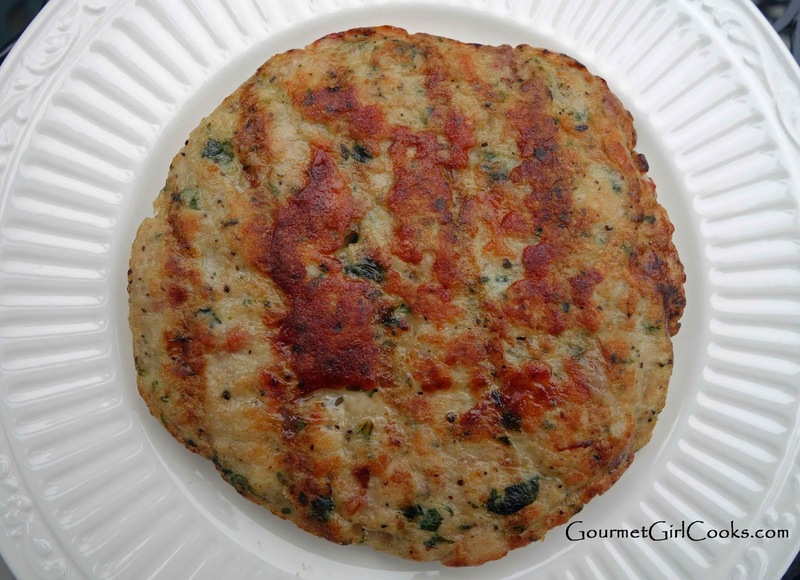 Think I will buy my own ground chicken and try to make my own. I agree that you could probably make your own that were much better. I decided that I would probably do so as well next time. I do believe the longer we are away from "processed food" the more we realize how much better the unprocessed stuff is.